Xiaomi has sent press invites for a launch event scheduled on April 25 in China. The company is expected to unveil its Mi 6X smartphone which was recently certified by TENAA telecom regulatory body in China. 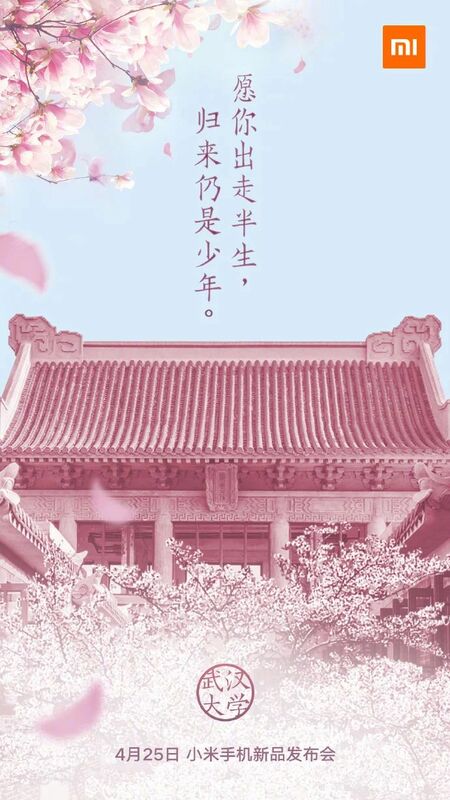 Through official Weibo account, Xiaomi has posted a teaser that confirms a press conference at China’s Wuhan University, alma mater of Xiaomi CEO Lei Jun. The teaser, however, doesn’t exactly name the smartphone though reports have indicated that it would likely be the upcoming Mi 6X. As per the TENAA listing, the Xiaomi Mi 6X will be arriving a 5.99-inch display with FHD+ resolution and 18:9 screen aspect ratio. The device is of 158.88×75.54×7.3mm dimension, and the listing reveals a red colour variant of the phone. Under the hood, Mi 6X will be powered by an octa-core processor that clocks at 2.2 GHz. There have been conflicting reports as to which chipset exactly will the smartphone be packing. While some reports hint Qualcomm Snapdragon 630 SoC or Snapdragon 636 SoC, others have hinted a MediaTek Helio P60 chipset inside the device. The CPU will be paired with either 4GB or 6GB of RAM, and these devices are expected to feature 64GB and 128GB of storage respectively. The Xiaomi Mi 6X has also been revealed to carry dual camera setup on the rear. It is speculated that the Mi 6X will be sporting a combination of 12MP Sony IMX486 and 20MP Sony IMX376 as part of its primary dual camera setup. There will also be another 20MP Sony IMX376 front-facing camera. The smartphone will run on Android 8.1 Oreo-based MIUI out-of-the-box and will be backed by a 2910mAh battery. The battery will also be equipped with fast charging technology. Pricing details of the upcoming smartphone, however, remain unclear at this point. While the smartphone will remain exclusively be introduced to the Chinese market, it is speculated that the 6X will be shipped as Mi A2 for global release. The Mi A2 would be the part of Android One program for a stock Android experience. Xiaomi Mi A2 moniker was lately found in the source code of Xiaomi India’s official website by a Twitter user. Just as the Mi 5X launched as Mi A1 for global markets, the Mi 6X is expected to be brought to India as Mi A2 or Mi A1 (2018) version. More information on the smartphone will be unearthed as the launch date inches in closer. I hope price is kept under 18000Rs for all versions!!!!! Above that it’s dead on arrival!!!! !